Italy's eternal city is a must-see. 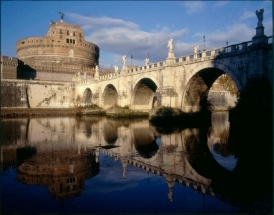 A veritable museum under the open sky, Rome offers countless treasures and lovingly preserved ruins. Architectural wonders like the Roman Forum and the Colosseum represent 28 centuries of history, while integrating seamlessly into the city’s modern-day landscape. An apartment with a panoramic balcony in Rome's centro storico (historic district). A spacious and charming apartment in the heart of Trastevere. Modern bedroom which has been fully renovated, with a kitchen in common use, in the historic center between Piazza del Popolo and Piazza di Spagna. A large studio apartment with sloped ceilings and a panoramic balcony in Rome's centro storico (historic district). A quiet and bright apartment with a beautiful balcony in Rome's centro storico (historic district). Charming apartment on 2 levels with a terrace on each level, in Rome's centro storico (historic district). Modern bedroom with a kitchen in common use, which has been fully renovated, in the historic center between Piazza del Popolo and Piazza di Spagna. A charming and cosy apartment in the heart of the Monti district.